Daybreak: If this game is "so easy," why do baddies fail so hard? If this game is "so easy," why do baddies fail so hard? I was on my mage, who belongs to a small guild recently formed by one of the members who also left the raiding guild we were both in. The following conversation occurred between me and who I gather is one of the new tanks that were recruited for the core team. We were discussing how he can get geared up before the next raid so he asked if anyone wanted to do HoF, but most of us were saved. The guy wants to raid but thinks preparing for it is "too much work." Seriously? I looked him up and yes, he used to be in a solid raiding guild, though not Top 20 US like he claimed, and the GM to boot. But he was only in that guild for a grand total of 3 days so his claim was hardly a big deal. Why do people who get called out on their crap always have to claim that they're better than they actually are? 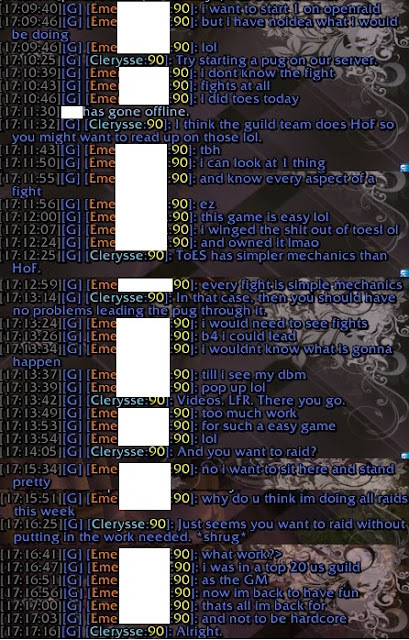 How could you possibly expect people to believe that you used to be in a Top 20 guild when you think watching videos to learn fights is too much work? I'm willing to bet he left that guild after only 3 days because his attitude didn't fit in with the raiding environment. I've grouped with some of the people in that guild and they sure didn't mess around. As a former GM of a raiding guild, I never would've let someone like this raid with my team. And we weren't even Top 20 or close to that. If he was the GM of such a guild, I really doubt they would have made even Top 20 on their server with his attitude, much less Top 20 in the US. He continued to argue and spout crap but I just paid him no mind since there really isn't anything more I could say to the guy. But he is a prime example of a raider who wants to get carried by others who came to the raid prepared. Fail "raider" is fail.